I made a second gelli print and it turned out much better to my eye than the first one. This one looks a bit like a primitive after the pull. I did remember to use the little bubble wrap sheet to texture the background. Of all of the ones I have done so far this is the one I like best. There is definitely a learning curve to this technique, but it is fun because I never know how it will turn out until I pull the print. Sometimes I figure the layer sequence not quite correctly and sometimes not all of the paint piulls off, but that adds its own charm. 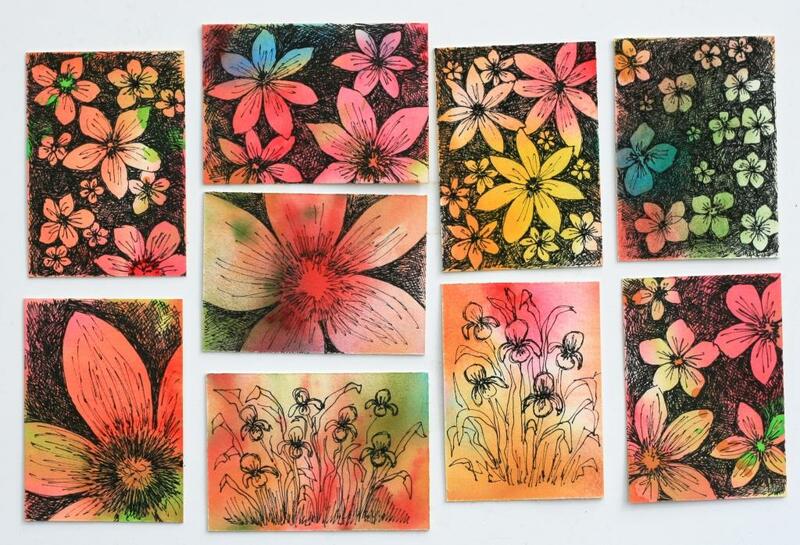 They are definitely monoprints because I could never reproduce them, even if I tried to do the same thing again. I did spend some time making some new aceo/gift tags. I have my next project in mind, but I have to do some photo research before I can start. Here’s a peek at the aceos. I’ll be listing some of them in the next few days. I have two beautiful hydrangea paniculata trees (pinky winky variety if you can believe it) flanking my front door. I had never heard of them before the landscaper put them in, but now I think they are quite lovely. They flower late summer with a large spike at the end of a branch. Unlike the blue and pink hydrangeas that we are most are familiar with, the spike doesn’t fully flower out – I would say less than 10%. There are lots of seedy looking buds that never open. The ones that do are a soft pink and beige color. 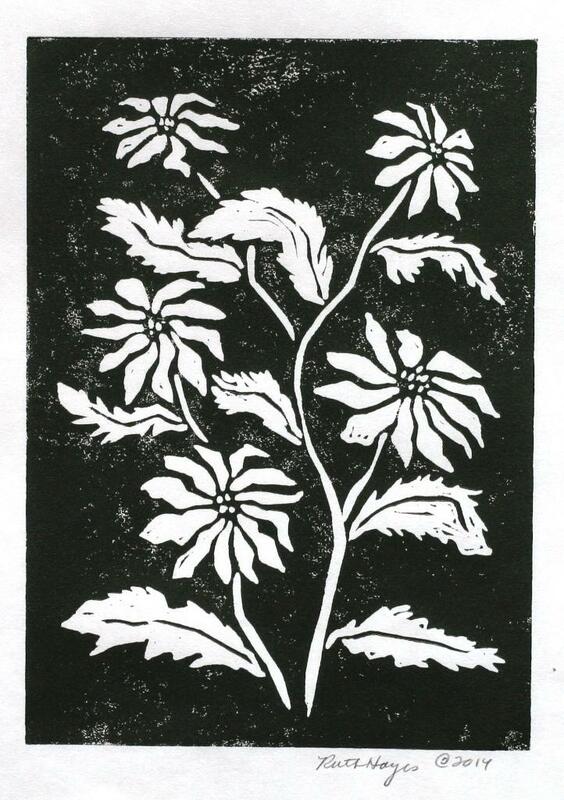 I clipped off a dozen branches last fall to dry and decided to use them as a linocut inspiration. 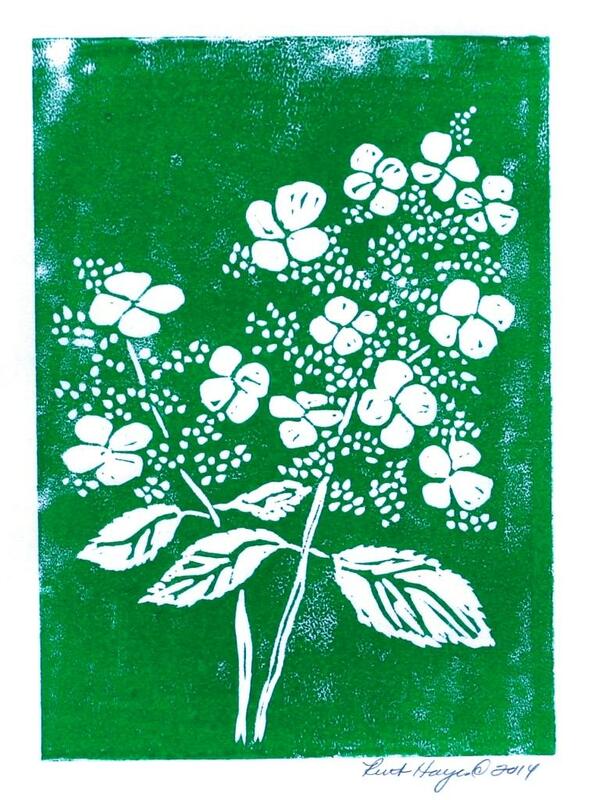 I like the linocut itself, but I am not sure I like the green ink. I wanted to use something other than the black, but I am feeling rather so-so about this color. Unfortunately, my inking palette is rather limited in this regard. 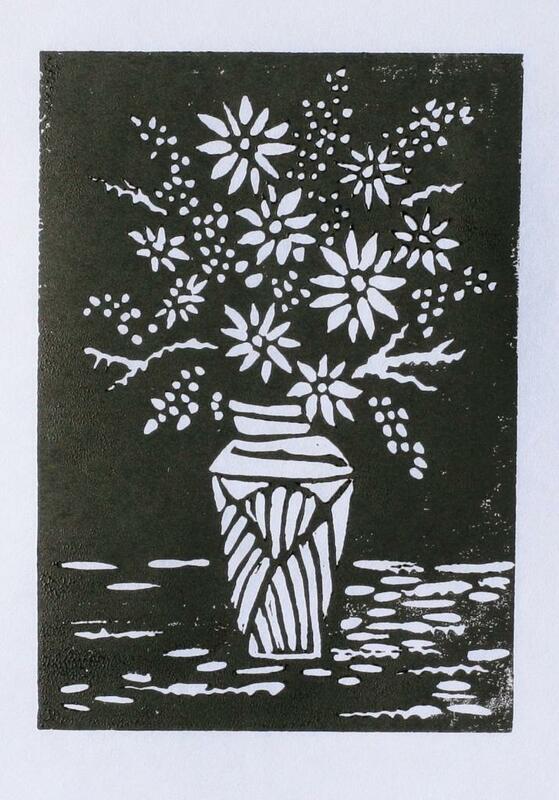 Stuck in the house after yet another snowfall and extra cold days, I printed and then watercolored the daisy floral linocut from the last post. I use the slicker side of a thin printmaking paper for the black one. After mistakenly using that side for prints a few months ago, I decided I like the way it turned much better than the rougher side. Directions said either side could be used, but naturally I chose the rougher texture that I was more familiar with. As it turns out, it is a little bit easier to get a smooth even print on the slick side. I have a heavier, more watercolor weight paper for the colored one. It only took one experiment to tell me that the thin paper buckles badly and doesn’t look very good. However it is much harder to get an even print on the thicker paper and sometimes I have to print several to get what I need. I have decided to get another brayer. Mine has to be close to 40 years old as I bought it for a college class. I’m checking into what to get so if anyone has a suggestion, I’d appreciate information. I decided to make the colored flowers hues close to the the real ones. I don’t know what species they are, but they grow prolifically on the road side in late summer and are a deep gold/yellow. They actually make a rather nice bouquet. Our mac is temporarily down and in the shop for a virus check so I haven’t been surfing through other blogs very much. Hopefully, I’ll get it back in a few days and be able to visit everyone more often. 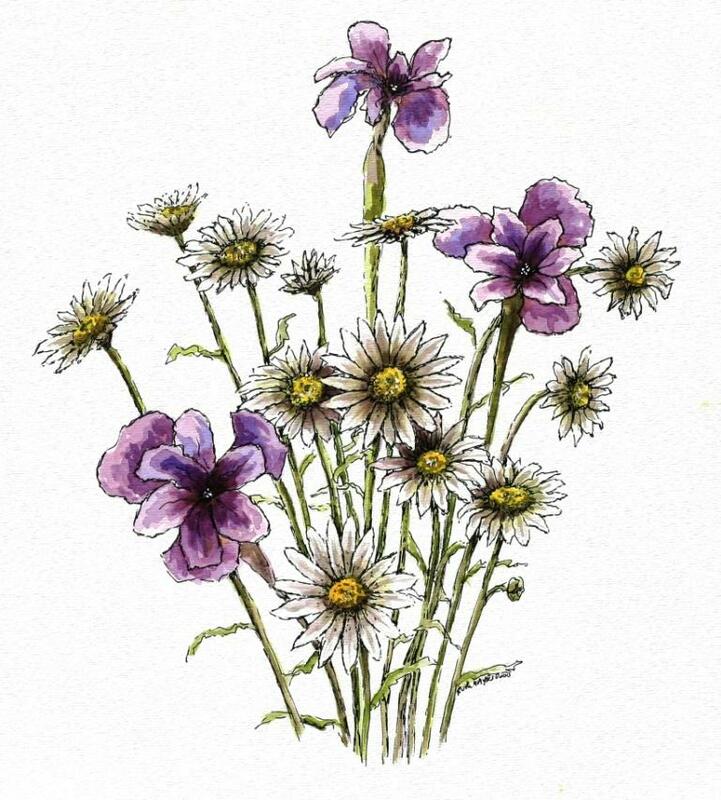 I watercolored the daisy linocut the day after printing it, when I was sure the printing ink had fully dried. 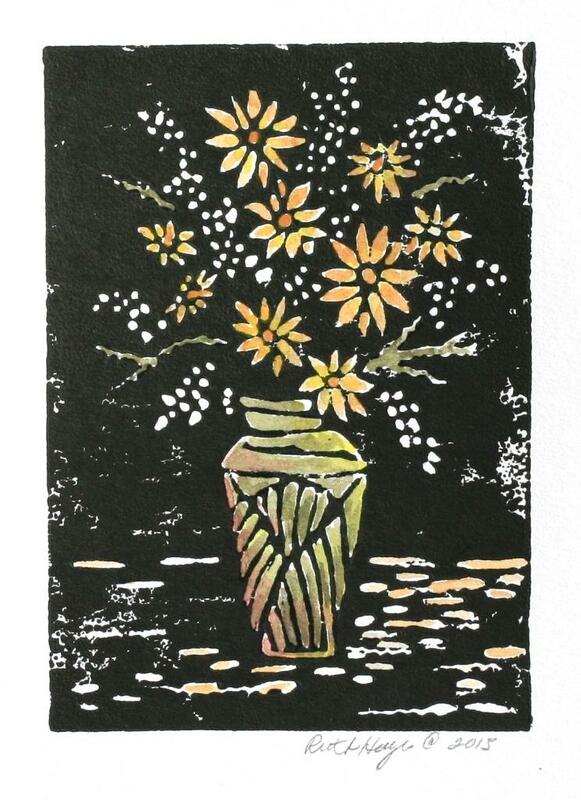 I chose to make the flowers golden yellow and the vase a mossy green. To add some depth, I edged the left side of the vase with a bit of red and put a bit of the yellow ocher on the table. I rather like the way the subtle colors add to it. And, in a typical klutz move, I managed to ruin the note card print. I had made a small smudge on the back side of the card when I printed it and tried to remove it with a watercolor eraser. I have used the eraser a few times on small smudges on watercolor board paintings and it worked just fine. This time, while it removed the smudge, I created a wrinkle in the card paper and it is now unsaleable. I even tried to iron it flat but no dice. Sigh. I guess I will have to use it for myself and not list it for sale in my etsy shop. 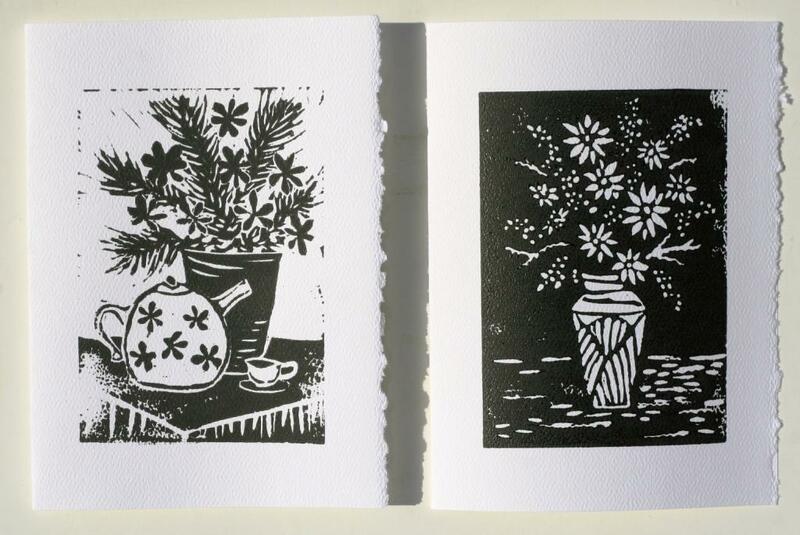 Next time I make a linocut print, I will try again. 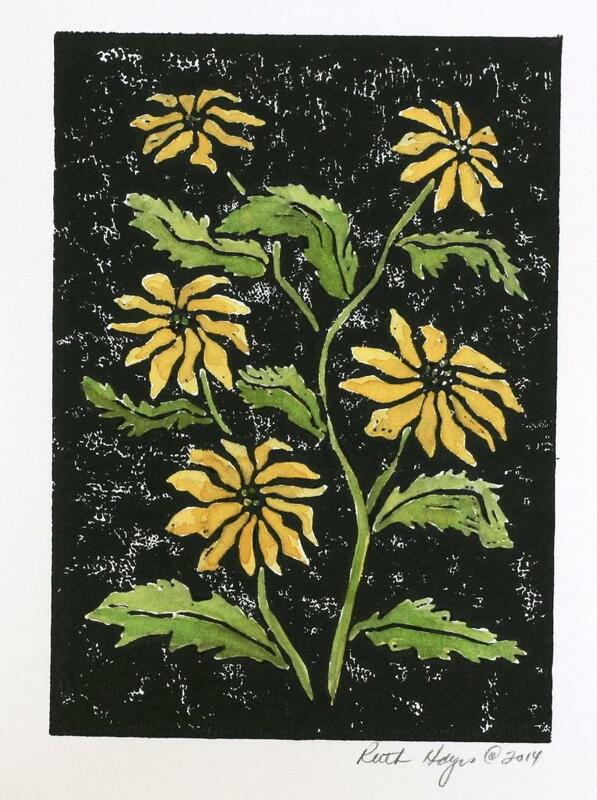 I saw some pictures of sunflowers recently and decided to make a floral linocut. I found a reference photo of daises that I had picked and put in a vase on my counter top a few years ago. Also, I wanted to make a companion piece to go with the other little linocut I made a few months ago and possibly make a matching set of blank greeting cards for my etsy store. I plan to color one of the prints, as I usually do. 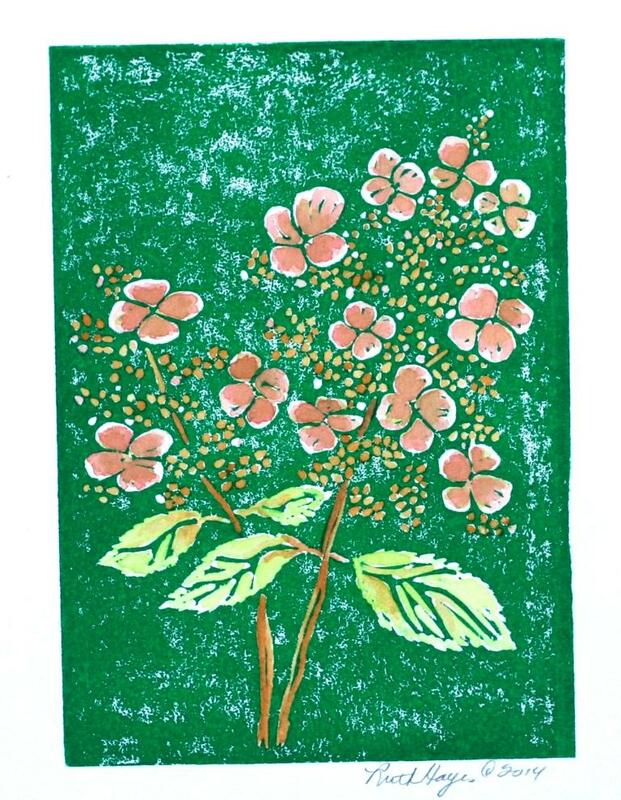 I think the flowers will be yellow and the vase, the mossy green, maybe with a touch of red so it will go a little better with the red teapot print. I’ll decide tomorrow when I paint it. I give the thicker paper a day to make sure the ink is fully dry.